To report a police or fire emergency, dial 911, preferably on a hard line so the dispatch center can see your address, but all cell phone carriers in Burlingame are now 911 compatible. You can also dial directly into Burlingame’s emergency center at (650) 692-0310 or into the County’s emergency center at (650) 363-4911 for countywide emergencies. Before a disaster, sign up for free SMC Alert emergency notifications at smcalert.info. Tune in to radio stations KCBS (740 AM) or KQED (88.5 FM) or any local TV news station. The City of Burlingame will post emergency instructions on its website at burlingame.org. The City also will send alerts via Facebook.com/BurlingameCityHall and Twitter @BurlingameCity. Burlingame CERTs who have signed up for SMC Alert will be deployed by the CERT Volunteer Program Coordinator using this text-based notification system. 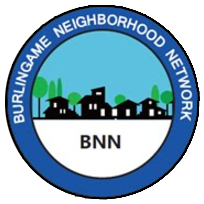 Burlingame neighborhood groups will be able to request help and receive official notifications by contacting their closest Community Command Post (CCP) by radio or by sending a runner. CCPs will be located at Burlingame’s six elementary schools.